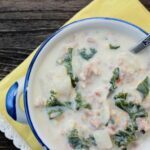 This easy Zuppa Toscana recipe is full of crumbled sausage, crispy bacon and potatoes in a creamy broth! This is our favorite Olive Garden copycat recipe! While everyone else goes to Olive Garden for the pasta… I am over there stuffing my face with bread sticks and soup. 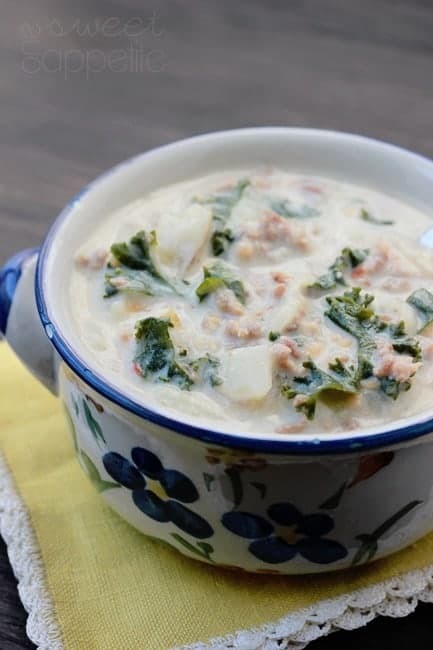 THIS version of their sausage and kale soup is amazing. It has got a great light consistency and the kale is cooked to perfection. Nothing warms your belly on a cold night better! It is delicious served with fresh rolls or bread sticks. I should note, we like to use spicy sausage but it is just as yummy with regular. How do you make Olive Garden’s kale soup? Gather your ingredients and prepare your cooking area. I find it is easiest to do all of your measuring and chopping beforehand. Brown 1 pound of ground sausage in a large stockpot. Stir in red pepper flakes, garlic, chicken broth, and water. Bring to a simmer. Meanwhile, in another pan, cook bacon pieces with chopped onions. Stir into your sausage mixture along with diced potatoes. Simmer for 30 minutes. Stir in kale and half and half. Cook 10 more minutes. 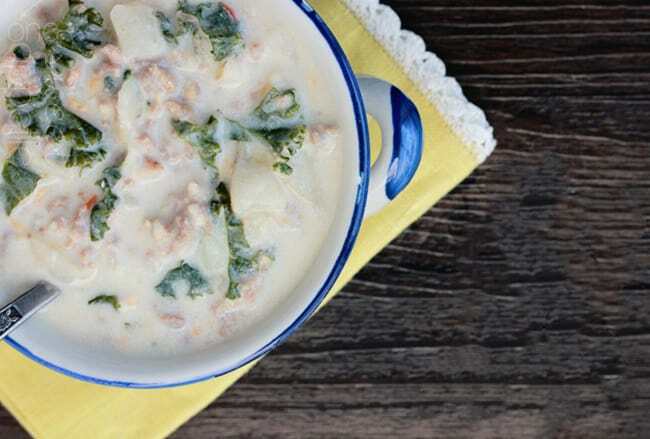 Can Zuppa Toscana be frozen? Yes. You can freeze this soup recipe. However, potatoes tend to break down once frozen and reheated. Freezing does give a slightly different texture in your reheated soup recipe. In addition, it is also better to hold off on adding the kale and half and half until you reheat the frozen soup. Start by browning your sausage and red pepper flakes (if using) in a large skillet. Once browned spoon into a large stock pot along with the garlic, chicken broth, and water. Add the uncooked bacon pieces and onion to the skillet. Cook until bacon is crisp and onions are translucent. Stir in with the sausage mixture. Quarter and thinly slice your potatoes leaving the skin on. Add to your pot and boil for 30 minutes, or until your potatoes are softened. Stir in the kale and half and half. Cook for 10-15 minutes, or until the kale is soft. I love to make this at home! So good! 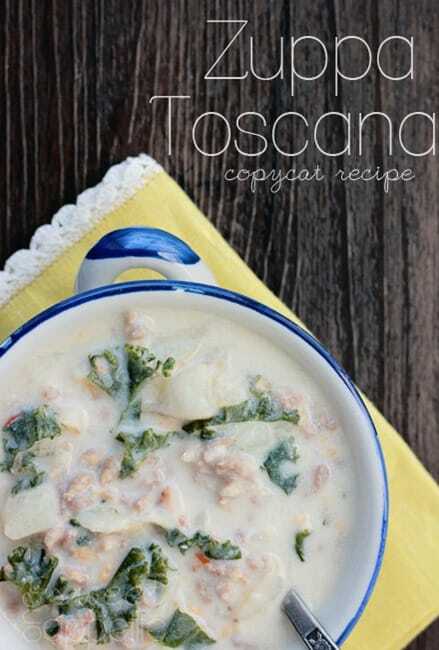 I love Zuppa Toscana! It’s so delicious! Mmmm this looks so good. I can’t wait to try making it at home. And I love your little bowl. Where did you get it? It’s one of my thrift store treasures. There are a few dings, but it’s so pretty I can’t toss it! I am in LOVE with Zuppa Tuoscana! Yum! I love this OG recipe. Can’t wait to make it at home. It is still very cold here in Chicago and this soup turned out fantastic! I put too much pepper flakes but will go easy on ’em next time. Thank you for the recipe! Just wanted to let you know, we have frozen this recipe a couple of times now and if you allow it to thaw on it’s own, it comes back together very nicely with just a little bit of milk. 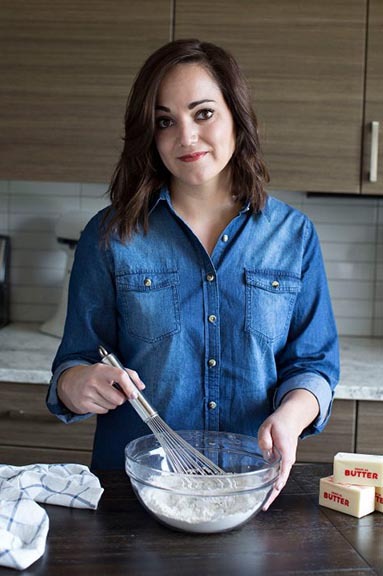 Thank you so much for such a great recipe. Good to know! We are making it this week since it’s so chilly here in Utah and I was thinking about freezing half.